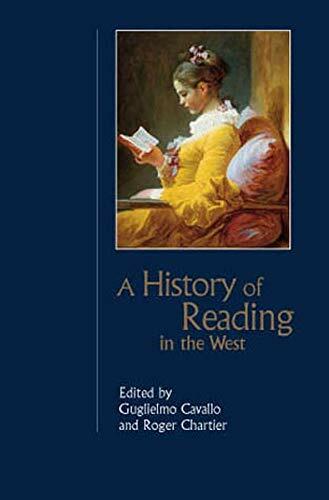 This path-breaking study will become the standard work on the history of reading in the West. It will be indispensable to students of cultural history, and to all those who want a fresh perspective on the history of books and their uses. Wide-ranging and authoritative account of the changing practices of reading from the ancient world to the present day. An international team of leading historians examine the technical innovations which change physical aspects of books and other texts, as well as the changing forms of reading and the growth and transformation of the reading public. Contributors include: Robert Bonfil, Guglielmo Cavallo, Roger Chartier, Jean-Francois Gilmont, Anthony Grafton, Jacqueline Hamesse, Dominique Julia, Martyn Lyons, M.B. Parkes, Armando Petrucci, Paul Saenger, Jesper Svenbro and Reinhard Wittmann. This path-breaking study has been highly successful in hardback and is now available in paperback for the first time.